The tax authorities would acknowledge that most citizens are perfectly law-abiding. We know that we’re obliged to pay certain taxes and we ensure that they are paid in their entirety, with full disclosure, prior to the due date. However, there always seems to be a minority who do everything possible to flout the law and conjure crafty schemes to dodge their tax obligations. Some get away with their dishonesty; others don’t. Those in the latter category are usually subjected to unforgiving punishment from the authorities. 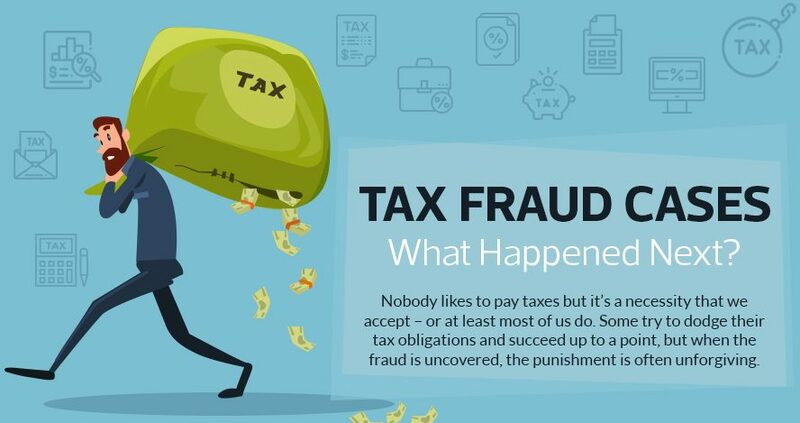 This infographic from All Finance Tax features a few personalities whose attempts at tax evasion were uncovered and who felt the wrath of the authorities. Al Capone, one of the most infamous gangsters of all time, dodged tax obligations on racketeering activities and, after being indicted for tax evasion many years later, he would serve most of an 11-year jail sentence in the notorious environs of Alcatraz. Some of those who commit tax fraud, far from showing any remorse for their egregiousness, see it as a badge of honor. Leona Helmsley, the ‘Queen of Mean’ who cited personal expenses like lingerie as business investments, arrogantly told reporters that “only the little people pay taxes”, while repeat offender Rashia Wilson took to social media to challenge law enforcement to catch her after she filed fraudulent tax returns. Once they did, she was given 21 years in prison. Even when those convicted of tax fraud do their time and take their medicine, the reputational damage will linger. Baseball legend Pete Rose is undoubtedly one of the sport’s all-time great, but his name will always be linked with the filing of false tax returns that led to a lifetime ban from Major League Baseball. His glittering career deserves better than to be so tainted, but neither he nor anyone else in the country has any divine right to flout tax. Find out more stories like these in the infographic below.